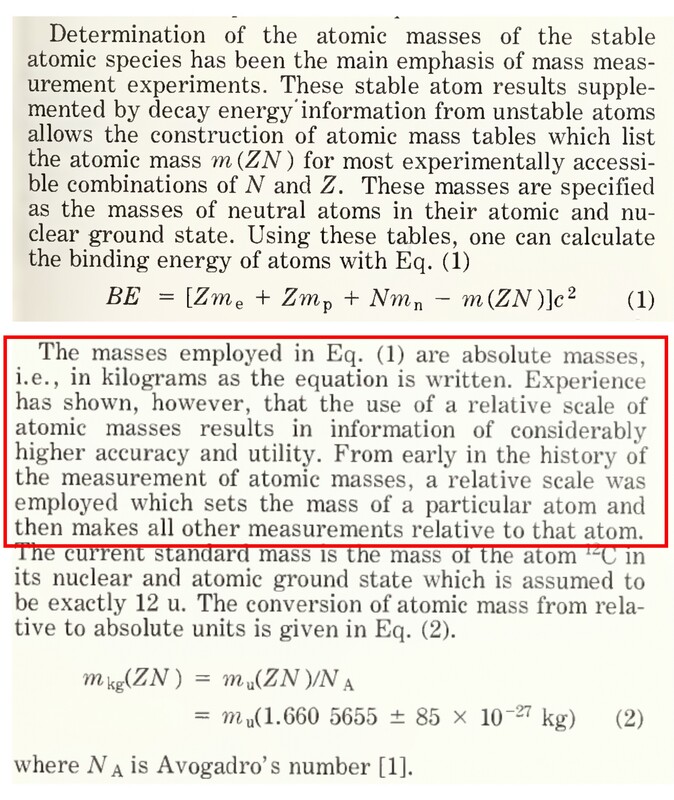 Is there any fundamental reason why atomic masses are quoted with respect to a certain element such as an arbitrary C-12 isotope whose mass has been set to 12 unit exactly? Previously, chemists have no other way to measure absolute masses hence they have been using a reference such as H or O which were set to 1 and 16 exactly for more than a century. I am a chemist and asked several people (chemists) as to why mass spectrometric measurements cannot lead to "absolute atomic masses" and they were of the opinion that it is difficult to calibrate a mass spectrometer and determine exact electric fields and magnetic fields of the setup. I don't feel that the calibration issue is the sole reason for using relative atomic masses still today. My point is that at least in principle, one could measure the m/e ratio of an isotopic and quote its absolute mass. I was thinking to this crude analogy: If we had a hypothetical atomic balance, which could weigh atoms, currently we have calibrated that balance by asking it to read the weight of a C-12 atom as 12 units (as many digits as the balance can read to infinity). All atoms are then weighed with reference to this balance. Although we know that the weight of C-12 atom is not exactly 12.0000000000000000000000000 units because humans set it arbitrarily. This approach looks very artificial. Opinions and perspectives of physicists would be helpful in understanding the logic behind relative atomic masses vs absolute atomic masses? I found one reference from Precision Measurements and Fundamental Constants, here W. H. Johnson makes the makes the following point shown in a rectangle that experience has shown that measuring relative masses are more accurate and useful. So it seems like an experimental issue to use a reference isotope. The molar mass of carbon depends on where the carbon comes from because the isotopic abundances differ slightly. Carbon from a coal mine will have a different proportion of C-13 and no C-14 compared with charcoal. So that is not so good for a definition. Not the answer you're looking for? Browse other questions tagged particle-physics experimental-physics atomic-physics atoms or ask your own question. Why not accurate masses of elementary particles? Is this a correct demonstration for why elements above untriseptium cannot exist? How can a Lego version of a Kibble balance measure the Planck constant?